Royal Doulton's First Pottery Was Established By John Doulton In The Lambeth Area Of London In 1815. His Son, Henry Doulton, Took Over The Running Of The Lambeth Pottery And Was Knighted For His Services To The Ceramic Industry By Queen Victoria In 1887. 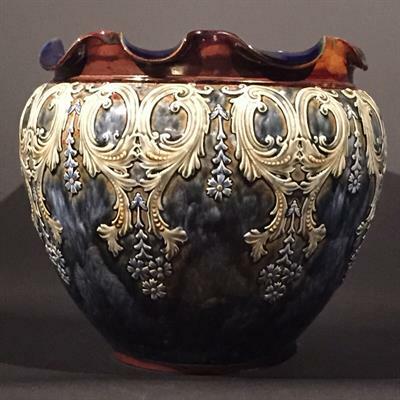 From The Early 1870s, Talented Artists Were Engaged By Sir Henry To Decorate An Extensive Variety Of Art Pottery, Including Vases And Figurines. The 20th Century Studio Flourished With Artists Such As Leslie Harradine And Harry Simeon Until Its Closure In 1956. The Jardinière Is More Than A Hundred Years Old And Is In Pristine Condition Considering Its Age. The Date And The Company Seal Is Marked On The Base.